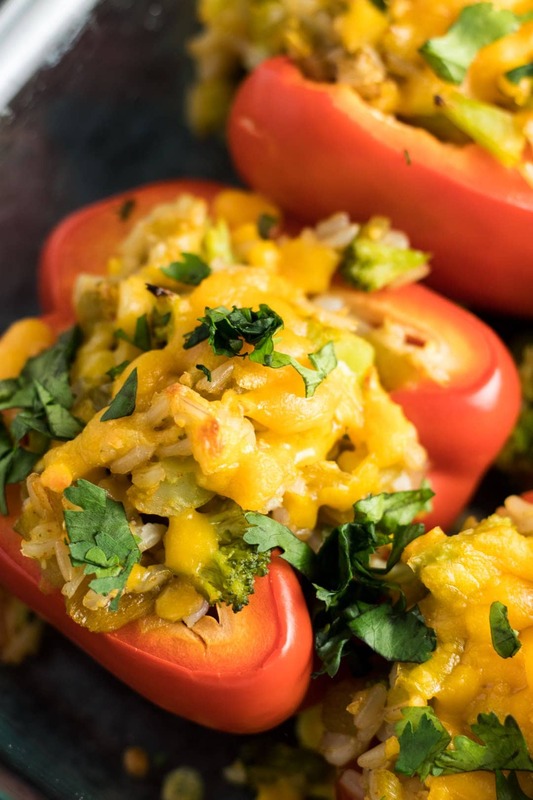 Low FODMAP Stuffed Peppers with Rice and Broccoli is a yummy vegetarian meal option and great on a budget. Try it for #meatlessmonday! 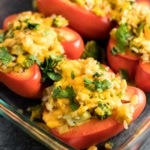 Hooray for Low FODMAP Stuffed Peppers! 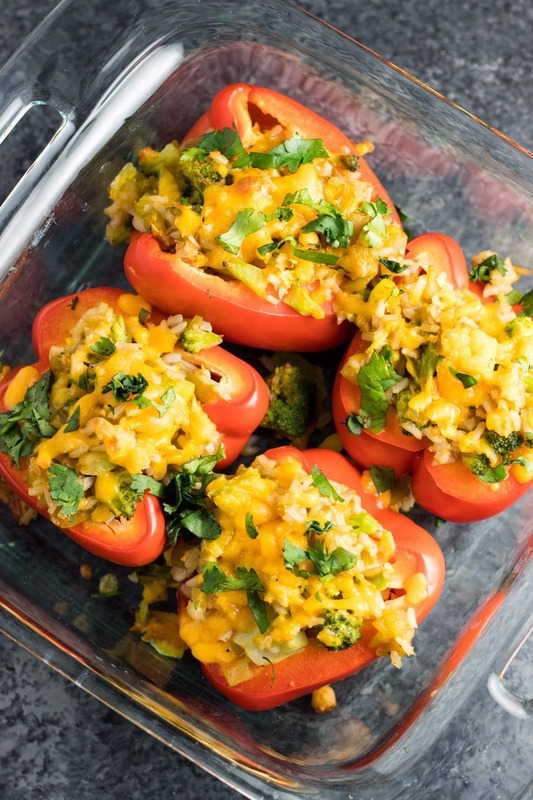 These yummy peppers are filled with broccoli, brown rice, mild chiles, and cheddar. They take about a half an hour to make. They’re perfect for meatless Monday. And, they’re pretty darn affordable for the low FODMAP diet. YAY! To make things even quicker, I turn to two of my go-to freezer staples from Birds Eye – brown rice and steamable broccoli. I love that you can have brown rice ready-to-eat, or use, in like three minutes and steamed broccoli (my favorite veggie!) in about five. Plus, these ingredients frequently go on sale at my grocery store. So, when they do, I stock up and store these in our freezer. I know I’ll use them, so I end up saving money. If I don’t use them in something like today’s low FODMAP stuffed peppers, I’ll use them as simple sides with a source of lean protein, like salmon or tempeh. They make for an easy way to throw together a simple balanced FODMAP-friendly meal that doesn’t take a lot of time to prepare. 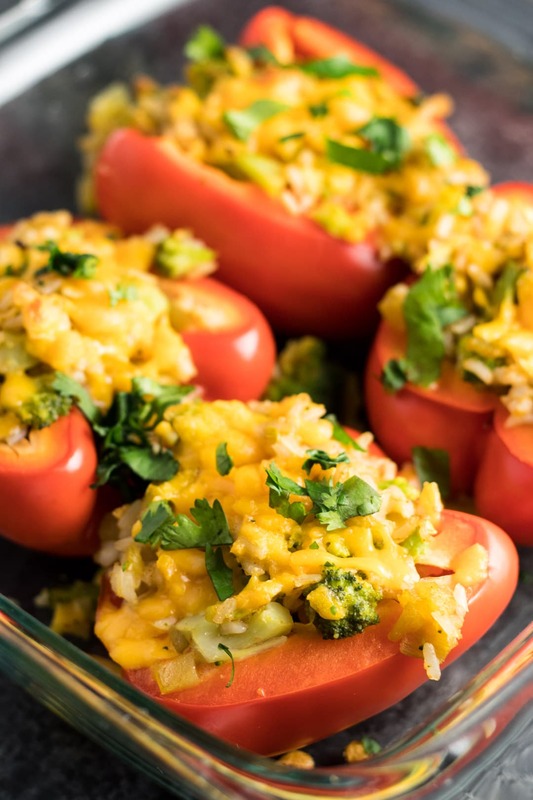 When I’m making this recipe, I will preheat my oven and then throw the broccoli and brown rice, separately, into the microwave to cook while I’m preparing the peppers. If I get done with the peppers before both of those ingredients are cooked, I’ll start to make the stuffing and add the remaining ingredient after it finishes in the microwave. If you’ve been around here for a while, you may know that I personally don’t tolerate most dairy*. So, when I do make this recipe (and many others), I’ll typically make half of it with real cheese for my husband and make the other half with Daiya Dairy Free Cheese-Style Shreds for me. Personally, I’ve found I tolerate Daiya’s products really well. 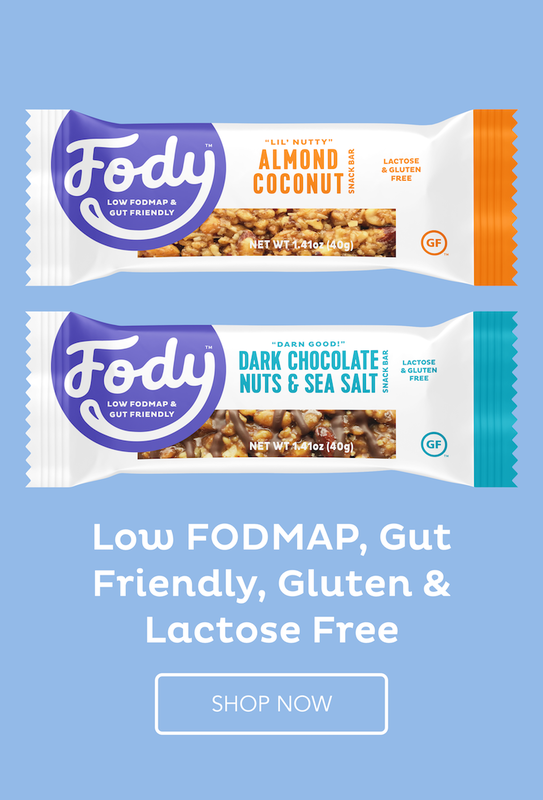 However, their products haven’t officially been tested for FODMAP content. So, I’d be cautious about using them during the strict elimination phase, but after, especially if you fall into the dairy-free camp like me and are looking for alternatives, I’d encourage to give Daiya a try and test your individual tolerance. *Note: I do tolerate and use ghee in my cooking. Preheat oven to 400°F. Spray a 9×13-inch baking dish with nonstick cooking spray. Place peppers halves into baking dish. In a large bowl, mix together olive oil, cooked brown rice, cooked broccoli, green chiles, salt, paprika, and 2 oz. shredded cheddar cheese. Once mixed, scoop mixture into pepper cups, distributing evenly. Top with remaining 2 oz. cheese. Bake peppers for 20 minutes or until the desired doneness of peppers is achieved. Top with optional chives or cilantro and serve warm. Red Bell Peppers: FODMAPs were not detected. However, peppers naturally-contain a compound called capsaicin, which may be a non-FODMAP trigger in some individuals with IBS. Broccoli: A low FODMAP serving is ¾ cup or 75 grams. Canned Green Chiles: Double check ingredients. Choose one that does not have onion or garlic. Green chiles also contain capsaicin, which may be a non-FODMAP trigger in some individuals with IBS. Like what you see? 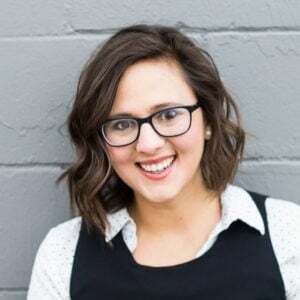 Sign up for the Fun Without Fodmaps newsletter and never miss a beat. Bonus: You’ll receive a downloadable eBook with my top 10 low FODMAP recipes. These look super tasty! And I’m always up for a budget-friendly recipe. With the holidays coming up, I might try this as an appetizer with some baby bell peppers. Looks good, where in the recipe does the broccoli come in? Whoops! Thanks for catching that, Caitlin. The broccoli is added with the brown rice. I’ve updated the recipe. Thank you! !